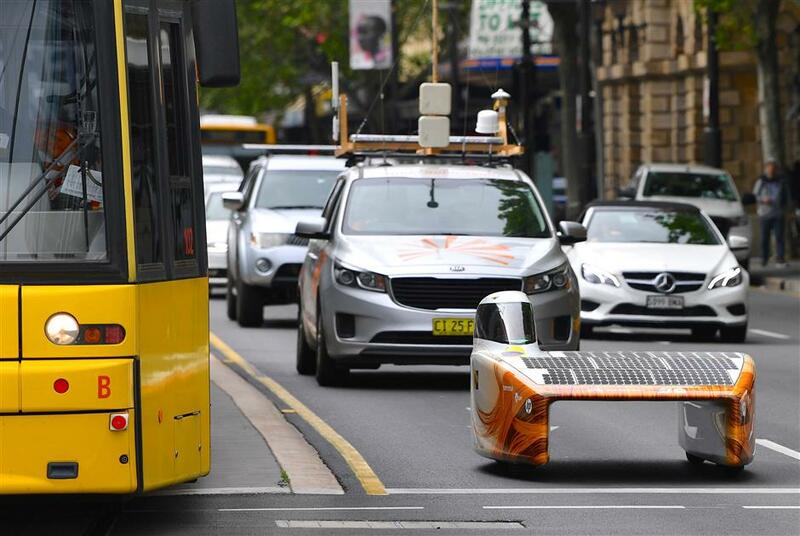 The Nuon Solar team's car named "Nuna 9" drives along a main street as it approaches the 2017 World Solar Challenge finish line in Adelaide, Australia, October 12, 2017. The innovative bi-annual contest, first run in 1987, began in Darwin a week ago with 41 vehicles setting off on a 3,000-kilometer (1,860-mile) trip through the heart of Australia to Adelaide. Dutch car “Nuna 9” won the race for the third-straight time, crossing the finish line on Thursday after travelling at an average speed of 81.2 kilometers per hour (55.5 mph). But another Dutch team, Eindhoven, was set to be crowned overall champion based on a system taking into account design, practicality, energy efficiency, and innovation, organizers said. Their family car, “Stella Vie”, carried five people at an average speed of 69 kilometers per hour, with event director Chris Selwood saying it was a practical demonstration of what the future might look like. “These incredible solar cars have been designed with the commercial market in mind and have all the features you'd expect in a family, luxury or sporting car,” he said.